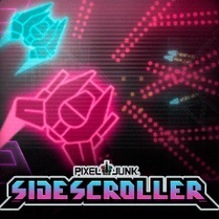 “Due to a time limited music licensing agreement between Sony America and the licensing agents (that I wasn’t involved in and thought the license was in perpetuity) there is a possibility that you will not be able to purchase PixelJunk SideScroller after this week, yes that’s right, we may have to take it off the store by the end of September. I think they are still negotiating to extend but I doubt it will happen at this point in its life cycle (music licensing people want money to extend and Sidescroller is past its sell by date – great game of course!). As of this writing the demo remains available on the western PlayStation Stores (AU, EU, US) and the full game is still available to buy in Japan and Korea. “The next chapter of the award-winning PixelJunk™ series brings a nostalgic retro vibe with PixelJunk™ SideScroller. Whether solo or local co-op with a friend, dodge flurries of alien bullets as you battle your way through sweeping stages full of hazardous fluid and endless shooting mayhem. Blast holes in walls or use your ship itself to drill past scorching hot magma. The fluids react in real-time to your actions and to other liquids, creating unique and exciting situations with every play. It will take strategy, planning and addictive replay to succeed! Be sure to retrofit your ship on the fly by switching between sophisticated weaponry to suit your style and search for hidden Power Ups and upgrades to unleash massive destruction!